Home > Why Use Promotional Mugs for Marketing ? Why Use Promotional Mugs for Marketing ? The answer is simple, why not? One of the most tried and tested ways of marketing is promotional mugs. It’s a traditional way of marketing, so why would you use anything else? Promotional mugs are one of the most effective ways to promote your company. 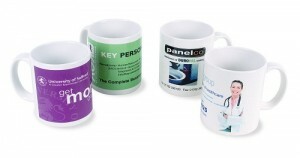 Promotional mugs are a low risk, high impact gifts which are guaranteed to be received well by the customer. Most companies offering promotional mugs for sale will only deal with big quantities, mostly 75 + but we can do as low as ONE, yes we can produce single or small quantities of promotional mugs. So, why are promotional mugs considered to be so effective? The simple answer is because they are so reliable. People will always need to use a mug, so their appreciation for the gift will be a sincere one. Whether the mug is used at home or at work, as the mug is a promotional product it is always guaranteed to be used. Your brand or company name will always be on the potential buyers desk, even when they are on a break. A lot of people take mugs home with them too, so why not leave a few mugs with the buyer, wherever they take them, your company name goes with them. Aside from the obvious use for customized coffee mugs – drinking coffee – there are many other uses for personalized coffee mugs. 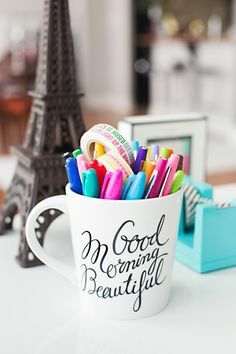 You will often see employees using custom coffee mugs as holders for office accessories such as pens, paper clips and scissors. Consider how little promotional mugs cost (from as little as £4.95 ea with us, see our offer of the month) when compared with other forms of advertising they are exceptionally great value for money. A well designed mug can remain on a potential clients desk for many months if not even years so the return on investment for this form of marketing is truly fantastic.